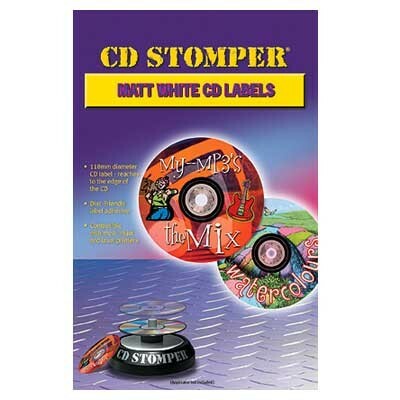 The Perfect Tool for Making Professional Looking CD/DVD Labels. 118mm diameter label ensures coverage of the entire surface of the CD (unlike some competitors). Matte finish labels are Laser and inkjet compatible. 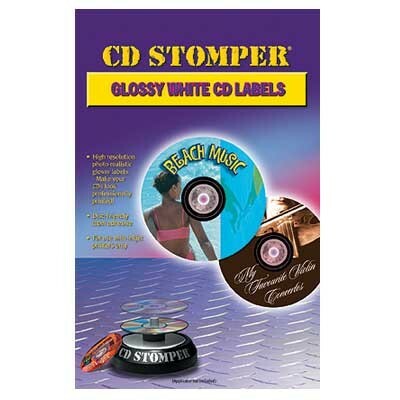 Labels are die-cut to line up with the CD Stomper software. Just print, peel, and apply. Labels are supplied in easy-to-use A4 format. The label sheets contain no open edges to catch in your printer. The label adhesive is disk friendly (water-based), making the labels ooze-free and safe for your printer. The labels are tested and will not peel off in drives, damage discs, or cause data read back errors. Labels protect the surface of the CD from scratches. Buy 3 for 8.99 each!